Click HERE to get the free downloadable guide that goes with this episode. “Comfortable” is a relative adjective. To pageant girls, it means to skip the Jessica Simpson shoes for their Michael Kors wedges and exchange rhinestones and lace for spandex and silk. In today’s episode, I’m going to teach you how to decide what to wear to your pageant rehearsal. In a competition, you have to be your best all the way around. You have to exude excellence from the very beginning – that means planning your wardrobe so it’s up to snuff with the competition… in fact, it is better than the competition. You’ll want to select all of your rehearsal outfits in advance and pack them according to the day you’ll wear them. I recommend having your outfits start off more subdued and then save the dressier ones for closer to the pageant day. It does two things: First, usually you’ll be doing more movement in the earlier days like learning the dance and stuff so you’ll want to be more comfortable and second, as you get closer to the title, you’ll want to step up your game and feel more like a queen. Also, consider the branding of the pageant itself. Miss International and Galaxy pageants are very glitzy and high-glamour; think: rhinestones galore. The Miss USA pageant is high-fashion model-type, so less rhinestones and more Calvin Klein appeal. The Miss America system is somewhat more conservative than others but still stylish and high-class. if you already won the title. I want to break down three easy steps that will take you about 60-seconds to consider and help you plan your wardrobe for a week or more of pageant rehearsals. I call my style, “professionally-fit.” Most days of the week, I’m rockin’ lulu leggings and a brightly colored blouse. When I go shopping, I have a vision in my head, maybe even a Pinterest board on my phone to consider if what I’m about to try on or buy fits my style. If not, I skip it. If yes, move onto step #2. Of course, you’ll consider the context being the fact that you are competing in a beauty pageant, so you can’t win if you’re wearing loafers and a ripped t-shirt from 7th grade. So, there’s that. But what I mean here is to consider what you’ll be doing in rehearsal on each day. If you’re learning the opening number dance that day, you’ll want to wear something more moveable. If you’ll be in the freezing cold auditorium from 7am to 7pm, wear lots of layers. This is the final step. You’re in the dressing room fully clothed in your new potential outfit. I want you to consider this: if someone took your picture and posted it on the front of your favorite magazine, would you approve? Always wear something that you’d approve of in photos because you will be photographed and you will regret flats, pants that are a size too big, and a pilling sweater. Most rehearsals request that contestants wear snappy casual clothes – that’s something you’d wear on a first date or on a night out with the girls. Usually jeans, trendy top, fashionable accessories. Some pageants, like the Miss International Pageant have a culture of glitz and glam even in the rehearsals. Since there is no talent portion of that pageant, it’s easier to wear a cocktail dress to rehearsal – and many of them do. I didn’t. 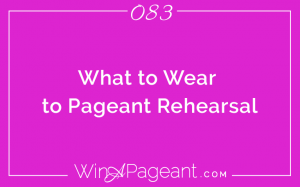 Great outfits to consider for any pageant rehearsal are: Jumpsuits, rompers, sheath dresses – they are classy, trendy, and easy to dress up and comfortable for all day sitting, standing and dancing in. What you wear will largely impact how you feel and ultimately, how you preform on stage that week. So, get yourself together, dress it up, step into your future title. Don’t over-think it, of course, but don’t forget it either. Because, that, my dear, is how you win a pageant. 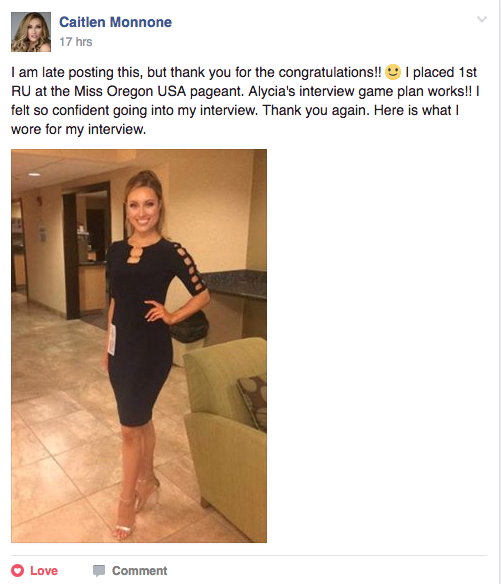 I’m gushing at the seams from how proud I am of the women in the Pageant Interview Game Plan. They are so dedicated to their success and by their ‘success’ I don’t just mean them winning the pageant, but influencing their community in such a powerful way. The Pageant Interview Game Plan is an online course that consists of 4 modules: Set Your Foundation, Plan Your Answers, Prepare to Dazzle, and Game Day: Showtime! These are the four steps that must be followed to nail your pageant interview. Each module is broken up into individual lessons that have homework for each one to get you further down the path to success. It’s designed to allow you to finish one module every week. Some of the women are flying through it much faster and others are taking their time to allow it to soak in a little deeper. Either way is fine because when you join, you have on-going access to it, so there’s really no time limit except for when you have to compete, of course! It comes with a Play Book that serves as a guide to get to know yourself, clarify your mission, research what the pageant is looking for, determine your stance on controversial issues, and tons of stuff that will transport you easily from confusion to clarity. It also comes with access to a private group on Facebook that is only open to members of the course. This is where I get to see all the magic happening! Every week day, I jump into the Facebook Group and get to answer questions to help my students excel in the program. And, boy-oh-boy are they taking advantage of this personal coaching opportunity! 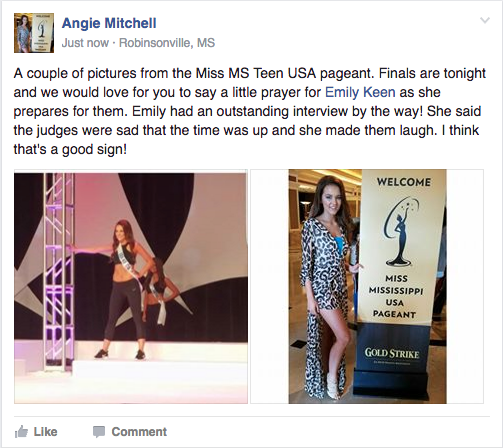 I wanted to share with you some of what is happening in there so you could see if this is a community that may help you with your pageant interview. 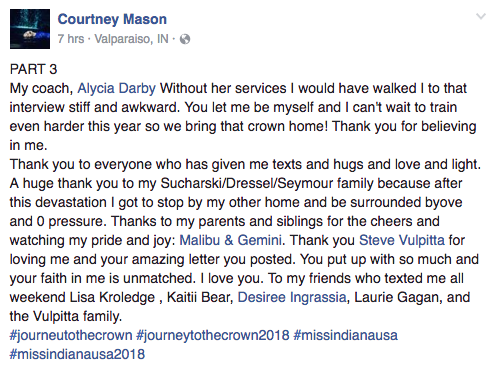 Courtney competed just 3 weeks after she got into the program and she was sharing gratitude for her supporters and said:”To my coach, Alycia Darby, without her services I would have walked into that interview still and awkward. You let me be myself and I can’t wait to train even harder this year so we bring that crown home! Thank you for believing in me.” Courtney is a model and rockstar with her platform. She’s providing so much nourishment to the other women in the group. Everyone knows her by now! Rita is a computer science major and recently interviewed with Microsoft. She said, “Who would’ve thought that pageant interview prep would have helped me with my first round of interview with Microsoft? !” It was all about personality and she knew herself well enough that she could confidently speak about herself even to a Microsoft rep! You’re right, Angie that is a great sign!! You’ve heard me say before that with me, you always get more than you pay for. I love presents, surprises, and treats so I promise to over-deliver every time. In the case of the Pageant Interview Game Plan, I have a ton of bonus trainings to help with other areas of competition as well. Like the wardrobe style guide – This training breaks down how to define your personal style and what to wear in the interview room. There’s also a training that shows you how to stand, pose, and move on stage to model your gown, active-wear, and swimsuit, and how to walk in general. When you join the Pageant Interview Game Plan, you have the option to get a Mock Interview with me over Skype. I record the interviews so you can watch them back and give yourself feedback. At the end of the mock interview, I always give an assignment and Amanda literally finished her assignment within 30 minutes and posted it in the group for immediate feedback. With that speed of implementation, she’s gonna be a huge success! She came to her interview completely prepared in hair and makeup and accessories! I wouldn’t have been surprised if she was wearing her heels, too! She’s an A-player, for sure. I learned so much from speaking with Samantha. She is extremely well-read and experienced in a variety of areas of human behavior. She’s a true leader. I’d like to invite you to join us in the Pageant Interview Game Plan. We are right in the middle of the enrollment period for the Game Plan, so you can join now (unless you’re listening to this podcast a month after it launched, then you may have to wait until sometime in the new year when enrollment opens again). But as the time of this podcast airing, it’s open for you to join! Private Coaching like this would usually cost you $900 every time you wanted the support. This program is less than $300, and since our group is relatively small still, you’ll be able to get lots of personal attention. I know the women in our group would love to welcome you and support your training. Plus, they would so appreciate your support, too! I’d love to be your teacher, mentor, and coach to guide you toward a successful pageant interview. If you have questions about whether or not it’s right for you, please email me at [email protected] and I’ll be able to advise one way or the other. I’ll see you in the Game Plan! Did anyone ever tell you to use your interview to let the judges know that you are truly ready for the win? Me neither. It was my 3rd year of competition that someone finally told me that this is a thing: That women actually showcase to the judges that they are ready to take on the responsibility of the title. It was a shock to me, but when I thought about it: just because you are competing doesn’t mean your really ready for it. In my first 3 years of competition, I was not ready for it. I wanted it still, but I wasn’t really ready to make it worth anyone’s while. Now, from the judge’s perspective I know why this is so important. A judge doesn’t want to choose someone that isn’t truly ready to take on the responsibility of the year because it’s not fair to her and also not going to move the pageant forward either. Why would they choose a girl who’s bumbling around when they could choose someone who’s on a path of readiness. Imagine if you won Miss USA right now and you were catapult into the limelight instantly. What’s your plan to actually succeed? What is your number one goal? Who should you reach out to? What should you say in media interviews? Imagine not having a purpose wouldn’t that turn into an awful year?! And then your year as Miss USA, instead of catapulting your future toward your goals with a solid purpose, you’d be drained of energy, wasting time until you could go back to where you were before all of this excitement. I’m going to break down for you what ready really looks like from the judge’s perspective. Most women think they have to be kind, be a role model, be fun or funny, and able to travel. Those are all really lovely things and hopefully you have some of those qualities, but for those of you that have watched women compete for 3 or 5 years and finally win, you could surmise that they didn’t become kinder or funnier or more able to travel. What they did was become Ready for their title. If the judges selected someone who was nice and a role model and able to travel, she could end up smiling in front of a bunch of children with her bags packed… but never truly accomplish anything all year. That’s not what we want. We want someone who’s ready to take on the world, ready to achieve great things and leave a legacy! 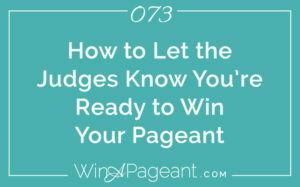 Specifically, your judges want a woman who has a clear goal, who takes action consistently toward her goal, and has a plan to collaborate with the pageant title to further achieve that goal. A clear goal is a measurable outcome that you want to lead the march onto. The more specific, the better. One of my clients’ goals is to increase literacy in the home by teaching parents to read to their children in ways that improved reading skills quickly. The consistent action she took was first to write a book that simultaneously taught parents how to read while reading to their children. Her plan as a state titleholder was to do a book tour across all the public libraries and donate her book as she went. She is currently doing that very thing as Mrs. Oregon United States. Another client of mine wanted to encourage a healthy lifestyle changes for people that struggle with healthy food choices. She collected healthy recipes from influential women across the nation and put them together into a cookbook. Her plan was to leverage her title to get in front of more people to showcase these healthy recipes. She did just that as Ms. US Universal she just got a monthly cooking show on a local television station. Having a goal, taking consistent action, and collaborating on a plan will let your judges know you are ready to use your title to the fullest. And that my dear is how you win a pageant. Listen, you can't avoid this question in your pageant. They WILL ask you this, so you gotta be ready with a powerful answer. In this Master Class, you'll discover the 3 Simple Steps to answer "Why You?" Comment “Simple” below the video and I’ll private message you the Freebie guide for this class. Follow along with the Freebie, print it and put it in your pageant binder for later! Today, I’m addressing the ever-important Farewell speech. This is under-estimated because at the end of a long year of service, sometime pageant women are so stuck on thinking of how awesome they are – and no doubt, you are – but they forget what this moment is truly about and how to make the most of it. Now, I’m not saying you always have to capitalizing on key moments, but You Ought to!! As a titleholder, as a person, really, you should always be looking for ways to honor others, shine some glorious light into the world, and enter the gates of heaven with gratitude. I’ll break down the 5 main components of your Farewell in a beautiful outline, plus I’ll share some specific advice on how to record it so you sound magnificent! Your farewell speech is sort of your final impression. It’s your opportunity to show gratitude to your team and final moment to inspire others and leave a legacy….It’s what you want your fans and supporters to remember of your reign, plus it’s your final opportunity to make a positive impact on the lives of a full audience of people with captive attention. It’s important to make it humble, yet full of personality, gratitude, and inspiration. Plus, most women will continue to compete, so it’s extra-vital that you don’t sound flippant or ungrateful to the pageant community. Also, I don’t want your farewell to be the one that everyone goes to the bathroom during or yawns and whispers through! Every time you’re given a microphone, it’s your responsibility to make the most of it. The basic outline of an amazing farewell speech has these 5 main components. 5. Sign Off: Let your personality shine and tie it back to the beginning. Start with a sentence or two about how you felt when you won the title. Some girls prefer to use a quote that speaks exactly what they are feeling. Just don’t make it longer than a sentence or confusing. Then, share one or two of the most impactful moments or biggest successes of your year. These should not be inside jokes, but rather things that the community can relate to and feel a part of. It’s most likely that your successes can be attributed to the help and gifts of others, so honor them here and share credit with your coach, sponsor, parents, directors, and whoever else helped you along the way. Next, show your gratitude to the people closest to you like your family and friends. Always include the producers of the pageant here and the director, owner, sponsors – this is vital! 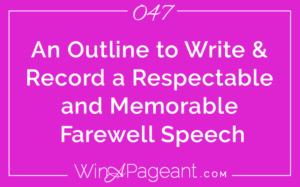 Your role as the titleholder is as the spokesperson for the pageant – you gotta use this time to honor the pageant itself. Then, share a piece of advice to the audience, contestants, or your successor – not all three – choose the one you feel most called to share insight for. Maybe you want to make a final plug for your platform or encourage the future contestants in the audience that night. Finally, a fun, personality-laden sign-off is a great way to bring a few smiles and tie your farewell back to the beginning to alert the audience that this is the end and they can start clapping. Remember, this is an outline, not a cookie-cutter fill-in-the-blank, so add your own creativity to the process. At the bottom of this post, I included an example of what I wrote for my farewell speech and published farewell as Miss California. It may help to see this in action there. Here are a few things to remember as you are writing your speech. It should be no more than 3 minutes, preferably 1.5. Mostly because the audience will stop listening at 3 minutes, but also because you’ll likely be walking and waving on stage, which, trust me, can get super awkward after 90 seconds. Always honor your pageant team! It’s likely your directors will have flowers to hand you on stage and your parents may as well, so be sure to include them in your speech. And, when their names come up, acknowledge that you wrote that, said it, and still agree with it – please do not just walk and wave like you had nothing to do with the words being heard. It’s okay to point, smile, giggle, and connect with your audience. In fact, it’s human and will help maintain attention. Avoid complex inside jokes as it will only confuse your audience and make them feel disconnected from you. Also avoid getting too specific like “Thanks to JJ for all the hard work she’s put in to help me succeed.” If you don’t say who JJ is, then the audience will again feel disconnected. Give titles like my sorority sister JJ or last year’s titleholder, JJ, or the local news producer, JJ – get it? You’ll see the examples at the end of this post. Once you have it all written, you gotta record it. This matters just as much as the content! excellent audio is vital for your message to be impactful. Sometimes your directors or producers of the pageant will have this all worked out. My directors at Miss California, had me record it and they edited in the music and made it sound great, but if not, you’ll want to be prepared with your own copy. It’s easier than you think. I’ll walk you through it now. First, always record your farewell speech with an excellent microphone so you avoid echoes, background fuzz, and hollow-sounding audio. You can get an inexpensive mic on Amazon, or even use your iPhone headset to plug in to record. In fact, I recently started requiring this of all guests on my show because I can’t stand the bad audio – and I’m sure it’s annoying to you too. I record audio with a free computer software program called Audacity, which also allows you to upload music with the voiceover. I’ll put a link to that in the show notes on the website so you can get it. Here’s how you do it: Open Audacity, record your voice over, add your music. Move the voice to start at 2 seconds into the music playing and lower the music volume to 20% volume or less – you don’t need a fade in or out. Remember, this is your final impression and you want to leave the audience feeling all warm and fuzzy about you. You want them saying kind things as they leave the pageant that night like, “Wow, the outgoing queen is really a class-act. She’s one I’d like to hire!” Or “I love the girl who gave up her title tonight – wasn’t she an incredible representative? !” This is the substance that winners are made of. Check out my farewell speech below and I hope you find the above tips super helpful as you write and record your own. And, that, ladies is how you win a pageant. Last year, I was granted a wish come true and the honor of carrying the title of “Miss California International.” To my delight, it came with a multitude of generous sponsors, a diamond necklace from Torgny Jewelers, an amazingly supportive pageant family with unconditional love, and a year of memories, friends, and accomplishments. To my family for keeping me grounded in authenticity so as not to be overwhelmed by pursuing perfection. To my Fairy Godmothers, Ronnie, Rachel and Jordyn, co-founders of the sisterhood of the traveling wardrobe. Hilary, for making magic happen in the form of gowns and makeup. Connie, Marty, Hilary, and Keri, spend countless hours and energy constructing an incredible pageant experience, securing sponsors, and providing opportunities for each contestant and winner. I know my success at Miss International was largely because of their passion for pageantry and desire to see me succeed. I’m forever grateful for you generously opening your hearts to me and providing unconditional support and love that made my year magical. I’ll continue to wear this keepsake necklace as it reminds me of the new friends, major accomplishments and sentimental moments from my year as Miss California International 2014. Being Miss California International has truly changed the course of my life – in an amazing and powerful way. Last year, after launching my free workout series, GetABetterBody.info, I received the title of Miss California International and the ability to reach thousands through the promotion of this platform. I had several big wins, most notable was my partnership with the International Sports Sciences Association and Ferrigno Fit (with Lou “The Hulk” Ferrigno) at the Hey There Muscles free summer workout series in Santa Monica. The Miss International Pageant was another highlight of my year, placing 2nd runner up and tying to win the Fun Fashion award, not to mention meeting incredibly inspiring women and growing closer to my pageant family. Parker, Michelle, and Maria for being friends on whom I can always count no matter how far the drive, how crazy the event, or how long the wait. Tiffany Tollett for taking me under her wing with support and tons of pageant tips; you are a blessing. My generous sponsors for providing in-kind gifts and financial support to guide my success. Torgny Jewelers for creating a truly unique keepsake necklace for my reign. The National Pageant Volunteers for making the week in Jacksonville fun, organized, and memorable. Austin Ryde for giving me hair and make up at nationals that saved me thousands of dollars on plastic surgery. My family for unconditional love, a sense of self, and grounded expectations. Keri for her work behind the scenes, which surely isn’t easy, but it is powerful. Thank you for nearly doubling my social media following with the tags, reposts, follows, and shares. Hilary for being a mentor, who became a friend, who became a sister. Thank you for being my rock during pageant week, for lending a gorgeous gown that magically fit perfectly, and for always trusting me to follow my instincts while supporting what you knew to be in my best interest. You’ve always had my back! Connie and Marty: one of the strongest teams in pageants and in life. Your tireless efforts in fundraising, networking, and loving support helped me to compete at the national level with pride and enthusiasm. You were my number one fans and constantly reminded me of it with love, pictures and presents! I’ll never get tired of saying it: Thank You! 2015 Contestants: God has something planned for each of you. For one of you, it will be to experience this year as Miss California International. For the rest of you, it’ll be something even bigger! You have a light that needs to be seen and a message that needs to be heard. I can’t wait to see how you’ll shine! Orientation is a sea of judgment. It’s exciting and equally nerve-wracking; all the would-be titleholders showing up with their best foot forward to prove themselves as the winner. In this episode, I’ll teach you how to show up to your orientation as the actual winner. I want my girls mistaken for the reigning titleholder because this is the first impression you’ll give to the pageant director and to the other girls. You want to be sure it is accurate, inviting, and respectable. The best way I know to prepare a girl for orientation is to use what I call the “Next Year” test. It’s simple. Imagine if you were to win, next year you’ll have to attend the orientation for the incoming competition class. I want you to imagine how you will be then…and be that now!